I received a call once from a young lady who wanted to see if her husband could “experience a day as a beekeeper” – a birthday present. 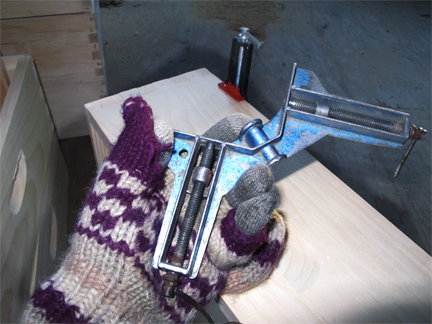 Somehow I don’t think she meant: sit in a room in mid-winter with clamps, a mallet, and a staple gun to assemble a small mountain of boxes and frames. Why, oh why do I think that? This is indeed part of my winter chores. 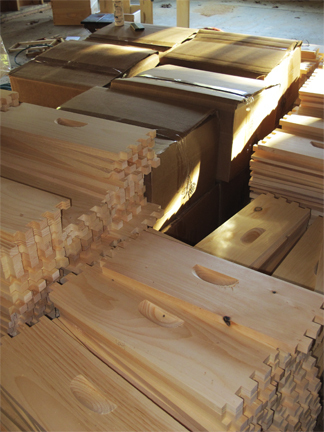 Last November Kelley Beekeeping had a great deal: Free Shipping! Kelley is one of my favorite suppliers, from whom I always buy wax foundation. Wooden ware, however, has always been a no-go because of the shipping costs. Kelley’s is in Kentucky and I am in a remote corner of Northwest Washington state, about 2,500 miles apart. The shipping, as we say, will kill you. The moment the free shipping kicked in I was on the phone for boxes and frames, lots of boxes and frames. As an aside, I always have more frames than would be required for the number of boxes I possess. This is because I remove 5-year-old frames, so I always need new frames. 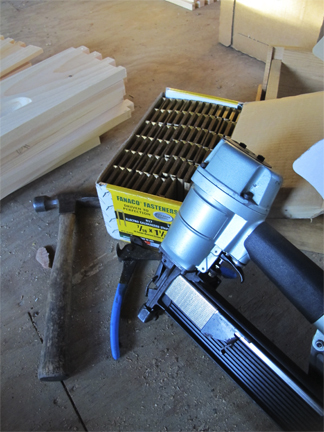 The frame removal is to reduce the build up of pests and diseases in the hives. I am at that odd place in beekeeping: neither small enough nor big enough to order assembled frames. 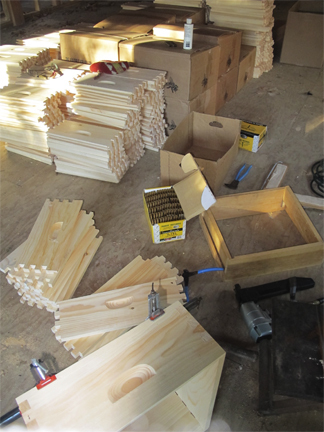 Assembling takes time, but costs less than purchasing preassembled wood ware. Time and money are both scarce, but I can usually find time in the depth of winter. 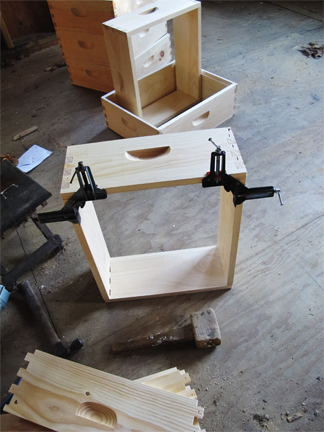 There is a wonderful device one can make to help assemble boxes, Michael Bush has a nice photo sequence on this bee box jig. I don’t have one of these jigs. It always seems to be on the to-make list, but doesn’t get made. 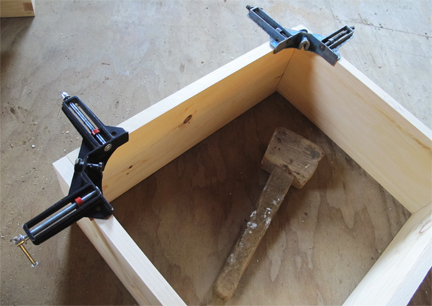 I use two angle clamps, a wooden mallet, and a power stapler. My goal: 20 boxes and 200 frames per week; to me, a reasonable goal. Then the generator broke down. The farm is off-grid and the surge of air compressor that drives the stapler is way beyond the capacity of our inverter, thus I need the generator. Last word is two weeks before it is fixed. Guess I’ll be wiring all the frames that I built. I do that in gloves as well. Do note that Kelley’s has just announced that in celebration of the 90th year, they are waving all shipping for all of 2014 (for orders over $200). If I weren’t already inundated with woodenware, I’d jump on it. January at Brookfield Farm is also: taxes, book festivals, book farmers markets, register hives, organize the bee notes from 2013 and all the other paper work that has to be done to keep the apiary going. Those things are truly a little boring to write about. That’s the news from Brookfield Farm Bees and Honey, Maple Falls, Washington. What winter apiary activities are you up to…or for those in the southern half of our planet: how’s the summer going? I bet it’s way warmer than here. This entry was posted in Beekeeping, Hive Components and tagged Assemble, bee, boxes, Brookfield Farm, frames, Maple Falls, Washington, wooden ware. Bookmark the permalink.